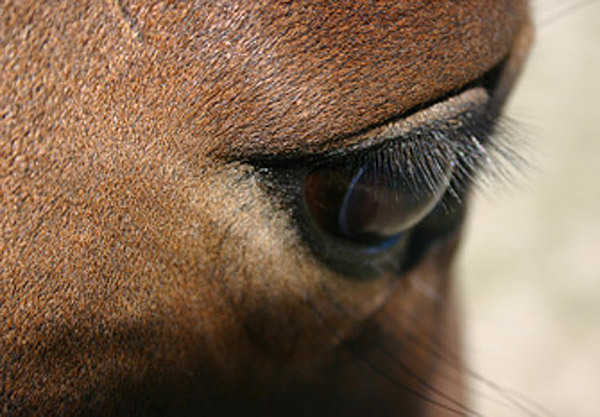 The injection of a low dose of a common antibiotic into the eyes of horses with recurrent or persistent uveitis shows promise as an adjunctive treatment, according to researchers. Equine recurrent uveitis (ERU) is widely recognized as an immune-mediated disease characterized either by recurrent bouts of eye-related inflammation separated by variable periods in which there are few or no detectable signs of inflammation, or persistent low-grade inflammation. The cornerstone of treatment consists of local immunosuppression or immune-modulation in conjunction with anti-inflammatory treatment. The main goals in treating ERU are the reduction of eye inflammation, the reduction or elimination of pain or discomfort, and the preservation of vision. Despite appropriate treatment, many horses with equine recurrent uveitis continue to suffer from recurrent bouts of inflammation. Surgical intervention has proved successful, including placement of a suprachoroidal cyclosporine implant, but these procedures may be not always be the appropriate course, might not be available, or may be declined by an owner. Thus, an effective additional treatment option may help to improve the clinical outcomes in those situations. Researchers Britta Fischer, Richard McMullen, Sven Reese and Walter Brehm, writing in the journal BMC Veterinary Research, noted there had been anecdotal reports on the use of gentamicin injections into affected eyes. However, no information evaluating the complication rate and/or treatment effect has been published. The four set out in their prospective study to describe the injection of gentamicin into the vitreous humor – that’s the clear gel that fills the eyeball between the lens and the retina. A total of 86 horses of various ages, breeds, and gender with recurrent or persistent uveitis were treated with the injection of 4 mg of undiluted gentamicin or preservative-free gentamicin. The jabs were given under sedation and local anesthesia. All horses were observed for immediate complications within 24 hours. Response to therapy was evaluated in 59 of the 86 horses, from 30 days up to 780 days. The study team reported that some bleeding was seen in the eyes of 30 of the injected horses, all of which had completely resolved within 5 days. Post-injection complications consisted of cataract formation/maturation in 5 of the 59 horses (8.5%) and diffuse retinal degeneration in three of the 59 eyes (5.1%). Equine recurrent uveitis or moon blindness is an inflammation of the iris that can be caused by trauma, infections in other parts of the body, the horse’s own immune system, or genetics, in the case of appaloosa and draft breeds. The majority of horses – 52 of the 59 with a minimum follow-up period of 30 days, were assessed as controlled, with an absence of recurrent or persistent inflammation, at their last recheck examination. Recurrent inflammation was documented in 5 of the 59 horses (8.5%), and persistent inflammation was diagnosed in 2 of the 59 (3.4%). The study team concluded that low-dose gentamicin injected into the vitreous humor showed promise in controlling different types and stages of uveitis. The ability of such injections to control persistent and recurrent inflammation warranted further investigation, they said. The authors said the way gentamicin worked on the disease process in ERU and other types or stages of equine uveitis remained uncertain. They speculated that rather than having a direct bactericidal effect on supposed bacterial organisms, gentamicin instead influenced or interfered with the immune-mediated processes of ERU. “Although purely speculative, the underlying mechanism of action of gentamicin may block or suppress the activation of specific T-cell lines; cells that are known to play a significant role in autoimmune uveitis. Intravitreal injection of low-dose gentamicin for the treatment of recurrent or persistent uveitis in horses: Preliminary results.